As with most portable electronics, iPhones use lithium-ion batteries that require regular charging. Charging plugs and cables can get easily lost or damaged, so we offer quality options for you. We service the whole UK from our base in York. Local customers are free to come and see us. iPhone Chargers and Cables There is 1 product. 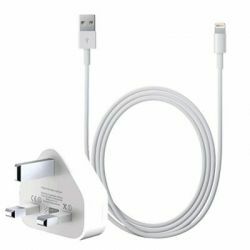 Official Apple plug with 3rd party lightning cable. Compatible with iPhone 5 and up, iPad 3 and up, and iPad Mini (all variants).